Another way to spell “Class”: H-E-N-T-O-F-F. Hope to see this DVD. Thanks & Happy New Year. I was just listening to Erroll Garner’s Paris Impressions which I recently re-purchased from a supplier in Tokyo. I played it about 7-million times when I was in college and, of course, loved it drunk or sober. This, I think, was released not long after “Concert by the Sea.” The question is was this a particularly productive part of his very long career? None of his other recorded stuff seem to have this zest and creativity. Just wondering what you thought. I can’t think of any Garner that lacks zest and creativity, clear back to his earliest 1944 Dial, Blue Note and Rex tracks and certainly including Paris Impressions. Concert By the Sea, one of the great live recordings in any category, has an edge over much of the rest of his extensive discography because it radiates a sense of discovery, surprise and joy rarely captured on record. Thank you, Doug. Well said. I most certainly will search for Mr.Hentoff’s DVD. He is one of my heroes. I still go back and re-read his bio entitled Boston Boy. I just watched the Hentoff DVD. It’s excellent work about a guy whose work I’ve enjoyed and respected for a long time. 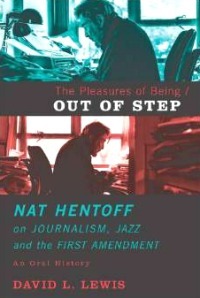 if Nat had done nothing else in his life other than “The Sound of Jazz” he would have earned a place in history. Dan Morgenstern called it the best ever jazz on television. I’d call it the best of anything on television. And, of course, Nat has done so much more.